After spending a day with Jeanne at her home in New Jersey, tape recorder rolling, ideas flowing, and later observing her teach Juilliard students at her Manhattan apartment, we both decided that a slower, more contemplative, refreshing approach was what we wanted for the upcoming interview. We weren’t sure yet where our talks would lead, but I’ll share with you here some of my thoughts after meeting this most interesting woman. 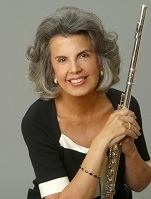 When I called Jeannie in July to ask for an interview for the New York Flute Club Newsletter, I was gearing up for a lengthy talk about her leaving the NY Philharmonic principal flute position. While I was planning to probe heavily into the whys and whens surrounding this decision, I also thought the usual questions about her career would be of interest to you. My research was substantial and I prepared a series of questions which I faxed to her in advance of the interview – just so she had a “heads up” advantage. I had no doubts that my visit with Jeannie would be enjoyable. Our many phone conversations leading up to the meeting erased any qualms I might have had about interviewing one of the world’s greatest, and already legendary flutists. Jeannie has old-world manners and is a delightful conversationalist; she will put anyone at ease. In spite of my calm, however, I sensed a problem with this interview. So much has already been written about Jeanne Baxtresser. All of the world’s major flute publications have told her story many times. She has been interviewed by Flute Talk, Germany’s Flute Aktuell, Canada’s Bravo, Britain’s Pan, Australia’s Flute Australasia, Lincoln Center’s Stagebil, and numerous others. What could my interview possibly add to this brew? I took a bus from Port Authority to her home in Harrington Park, NJ. While I waited for her to meet me at the station (a police station, no less – we joked about her coming to bail me out), I soaked up the scenery. Harrington Park is a beautiful, quiet, manicured town just 21 miles from Manhattan. The weather this fall day was crisp, the leaves were dazzling me with their colors, and the sun was beaming. I took pictures. As I rode with my host in her car, I commented how risky it would be for me to live here and work in the city. Inertia would surely ravage my career. Jeannie, however, is more disciplined. She has lived in this little paradise for the past fifteen years. She keeps an apartment near Lincoln Center to accommodate extra busy schedules, but has enjoyed commuting to and from her job in the New York Philharmonic. On the way to her home we stopped at a small grocery to pick up things for our lunch, then I indulged Jeannie one of her lifelong passions – a garage sale. She had found a listing in the local paper announcing a sale and just HAD to go. In towns like Harrington Park, so close to Manhattan and serving as home to such a diverse population, there are treasures to be found at sales like these. One mistake long ago, she said, was not buying a child’s handmade chessboard she had found. The child was B.F. Skinner, the noted psychologist, and the chessboard was being sold by the estate of his late sister. What a conversation piece that would have been! After a quick browse-through, not a treasure day, we headed for Jeannie’s house. As we turned onto her street, and she can confirm this – I all but gasped at the surroundings and mentioned that she probably took all this for granted. On a quiet, curved tree-lined lane, her home faces a beautiful, placid reservoir lined with a park and trees – it is so peaceful. Her home and gardens also capture this mood. Coming from the deep South, and desperately missing trees and open spaces, I stopped Jeannie before we went inside so that we could just listen a moment to the sounds the trees made in the breeze. You don’t get THAT in Manhattan! This opening conversation set the tone for our entire afternoon. Jeannie has a natural gift for honest, open communication; I loved listening to her recount her experiences and express her feelings. This gift has sustained her throughout her career and is the life thread of her relationships with her colleagues and students – present, and future. And, Jeannie’s FUTURE is what the upcoming interview will be about.